Belgische Wafels. 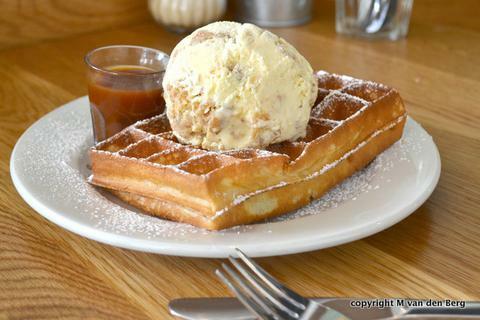 has five waffle machines on the go, crisping egg white batter into fluffy Brussels waffle rectangles, starting at R35. At the Belgische market only, you’ll find the ‘volkswafel’ topped with beef in Trappist beer, R60. Henrij Twigge offers less waffle toppings at his daily Yummyness stand. 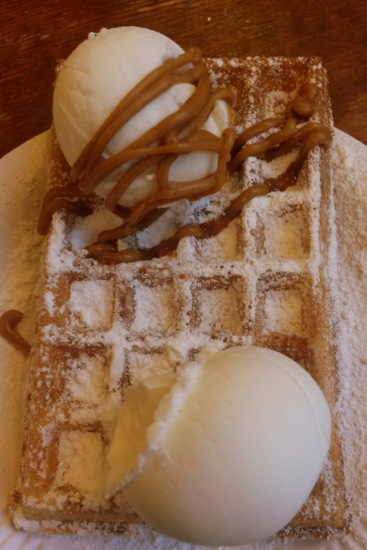 Try the signature waffle with spekulaas spread, cream or ice-cream (R40). Or top with Nutella, caramel or chocolate sauce. Also find pre-baked round Liege waffles (from R35) and Dutch stroopwaffels (R10). For the Love of Yummyness, V&A Market on the Wharf. Open daily from 10am to 6pm. Belgische Wafels, Neighbourgoods Market on Saturdays. 021-552-8381. Lefty’s Dive Bar. No waffle round up would be complete without Lefty’s Kentucky chicken waffle, R75. A stack of beer-based Belgian waffle quarters is topped with crispy bacon, and buttermilk-marinated, deep-fried chicken breasts. With its maple syrup drizzle, it’s surprisingly satisfying, but very sweet. Open Mondays from 4pm, Tuesdays to Saturdays from 11am. 103 Harrington Street. Tel 021-461-0407. Tashas Waffle House. Part ice-cream parlour, part waffle house, order signature waffles or make your own here. Select plain, choc-chip or red velvet round waffles (R16 to R24), and top with assorted syrups and ice-creams, and from jars of colourful toppings (Smarties, Oreos, almonds and wafers to fresh fruit). The four signature waffles cost R85: there’s banana mania, red velvet cheesecake, lemon meringue or apple crumble. The popular red velvet cheesecake tops a red waffle with cream cheese, shortbread biscuits, mixed berries, two scoops of strawberry sorbet and strawberry coulis. Sun to Wed 10am – 9pm. Thurs to Sat 9am to 10pm. Constantia Village. 021-794-5449. The Creamery. Like their glorious ice-creams and sauces, these rectangular, biscuit-like malted waffles are handmade from real ingredients. Waffles cost R42 with a single scoop of any ice-cream flavour, or R60 with a double. Sauces and toppings (R5 to R12) include chocolate, sea salt caramel, lime curd or blowtorched banana halves, to toasted almonds or coconut or marshmallow. Mon to Thurs 12pm to 6pm; Fri and Sat 10am – 11pm. Durham Ave, Salt River. 021-447-7690. A version of this appeared in The Times on 20 May 2015.